Whether you're new to making jewelry or an experienced jeweler, taking classes can be a great way to learn new jewelry making techniques. However, sometimes finding classes can be more of a challenge than learning to make jewelry. While you might use online tutorials, a hands-on class is an excellent way to build your skills. Check for jewelry classes with your local public school system and community college. If they have a well-developed website you may be able to locate the classes by browsing their offerings, but sometimes you will have to explore further. If you can't find classes listed online, call your adult education office. If you’re not sure where to find it, call a few high schools or your local school board and tell them you’re interested in adult education classes. They’ll be able to give you the information you need. Once you find the adult education contacts, simply ask if they have any jewelry making classes available or know of any in the area. Many rock people are also jewelry people because they have to do something with all those rocks. Your local gem and mineral society may have classes or they can put you in touch with members who teach. Check out associations such as the American Federation of Mineralogical Society for links and information about rock clubs in your area. If you can get your hands on the May issue of Lapidary Journal Jewelry Artist, this issue has an index (published in May each year) which lists gem and mineral clubs, schools, and much more. Even if it's well past the month of May, call your local library to see if it carries this magazine. You can go to the magazine's website and read through their club, society, and school listings online. The site also offers online workshops, so you can learn a wide variety of techniques on the site. If you live in an area that has a bead store, this is also a great place to start learning some basic jewelry techniques. Many of these stores offer a variety of bead-related jewelry classes such as seed beading, basic bead stringing, wire working, and glass bead making. Jewelry making has become a popular art and craft, so get out into your community and do some research. Read your local paper and browse websites that promote your local community. Don’t overlook your local yellow pages. Look for classes and clubs (bead groups, gem and mineral societies, and other artistic clubs). Check with your community centers, senior centers, and YMCAs. Go to local art galleries, art shows, and craft fairs and ask the jewelry makers if they know of classes. Many artists are teachers themselves. 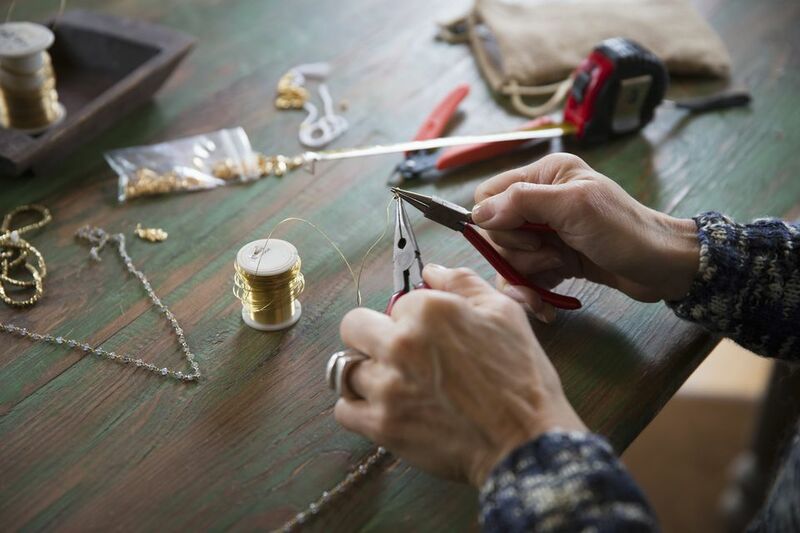 Whether you live in a large city or a small town, it is likely you will manage to find jewelry making classes. You will have to do your research and perhaps make a few phone calls. But along the way you will be building a network with other jewelry makers.